In terms of Fabrica-at-exhibitions this last year, Sam Baron's studio has been blazing a trail in particular, doing multiple exhibits in multiple cities. Almost too many to track. 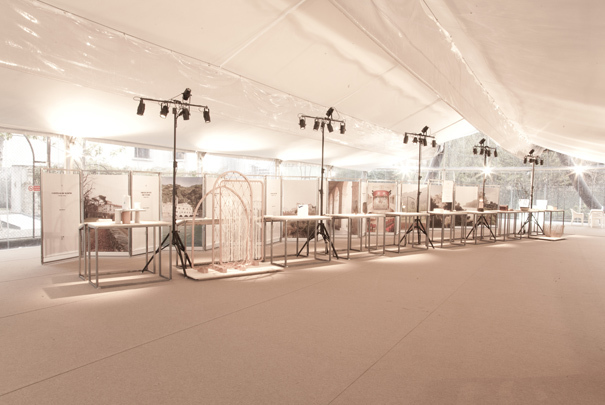 This show took place on Necchi's tennis court, and comprised objets designed by Sam's studio, each speaking of a particular FAI property in Italy. Each researcher was sent to a different historical property, across Italy, and had two days to understand the place, talk with locals, design an object which conjured the place, and make it, using local craft skills or artisans, and with no budget! Given that test, it's somewhat amazing that the objects that emerged from this brief are so lovely, considered and evocative. As with a Fabrica dinner on a Milano tram I will mention shortly—also organised by Sam's studio—the thoughtful reflection and delicate craft was often seen as welcome relief after the "shouting about chairs" of Salone elsewhere. Although there were other fine exhibitions (such as Drawing Glass in Paris and From The Floor Up in London, also by Sam's studio, as well as a major Colors exhibition at the Festival of Dangerous Ideas in Sydney)—and Aaron Siegel's studio is working on a major show for Rome at the moment—the other one I'll pick out is for the Lisbon Architecture Triennale, a few weeks ago. Again, Sam's studio took the lead here, though working with David Penuela from Aaron's team. Well, almost one year in. Although I started formally at the beginning of November, I was well into planning and prep by this time a year ago. So now seems as good a time as any to review progress and post a series of reflections about work thus far. This is the first in a series of posts running this week, reviewing some of the changes made, and the projects produced. In short, it's really coming together. I've had to make some tough organisational decisions, which I won't go into here in too much detail but I will share many other things. We’ve just enacted a restructure, for instance, from discipline-based departments to thematic transdisciplinary studios. Indeed. And although creating the appropriate structures and processes helps, it's the small things that create culture. The habits. After a first six months of hard work, it was clear we were taking Fabrica forward into a new stage. But around June-July, some kind of threshold was reached, and a new momentum had been generated. It's funny how the work builds and releases like that. It's imperceptible at the time, but suddenly discernible as soon as you're over the threshold. And then August, which is a holiday for Fabrica (as it still is in much of Italy.) So it seemed the right time to reflect on the previous 11 months of work. 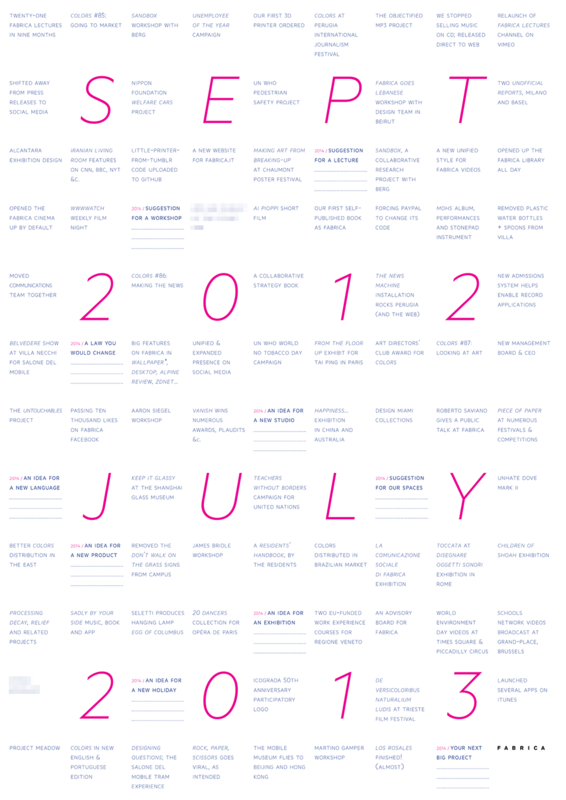 I produced a poster covering those months prior to August 2013 (I started in November 2012, so it's not all under my leadership.) This was a kind of "thank you" to the team, and a summary of where we are. And yes, a poster as thank you is what happens when the boss is a designer, which is hardly efficient—but then there is more to life than efficiency. Here it is (with a couple of secret events blurred out.) There is a lot there, and I'm really happy with much of it. But better, there's a lot more to come, and I'm incredibly excited about where we go next. More Informal Annual Review posts to follow over the next few weeks.